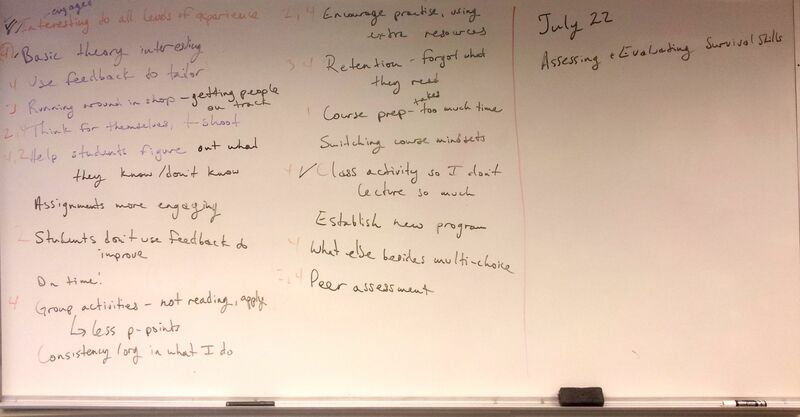 Last week, I presented a 90-minute workshop on Assessment Survival Skills during a week-long course on Assessing and Evaluating. Nineteen people attended the workshop. Sixteen were from the School of Trades and Technology (or related fields in other institutions). There were lively small-group discussions about applying the techniques we discussed. If you need more or better activities and assignments quickly, try techniques where students choose, modify, or create questions based on a reference book, test bank, etc. When I asked for more techniques, the idea of challenging students to create questions that “stump the teacher” or “stump your classmates” came up twice. Another suggestion was having students get feedback from employers and industry representatives. At the beginning of the workshop, participants identified these issues as most pressing. Based on that, I focused mostly on helping students do their own corrections/feedback (#3), and how to generate practice problems quickly (#5). Interestingly, those were the two ideas least likely to rate a value rating of 5/5 on the feedback sheets — but the most often reported as “new ideas”. I think I did the right thing by skipping the techniques for helping students follow instructions (#6), since that was the idea people were most likely to describe as one they “already use regularly.” Luckily, the techniques I focused on are very similar to the techniques for addressing all the concerns, except for a few very particular techniques about reducing student dependence on the instructor in the shop/lab (#4), which I discussed separately. I received complete feedback sheets from 18 participants and 16 of them identified at least one idea as both new and useful, so I’ll take that as a win. Also, I got invited to Tanzania! Participants talked a lot about what it’s like to have students who all have different skills, abilities, and levels of experience. Another hot topic was how to deal with large amounts of fairly dry theory. We talked a lot about techniques that help students assess their skills and choose what content they need to work on, so that students at all levels can challenge and scaffold themselves. We also talked about helping students explore and choose and what format they want to use to do that, as a way of increasing engagement with otherwise dry material. I didn’t use the term, but I was curious to find out in what ways Universal Design for Learning might be the answer to questions and frustrations that instructors already have. If I ever get the chance, as many participants requested, to expand the workshop, I think that’s the natural next step. Sounds terrific. Makes me wish I were still teaching!